The stories and pictures in this website are the culmination of many thousands of hours of research by volunteers, often with the assistance of descendants of Frampton on Severn's First World War servicemen. It has not been easy, for more than 80% of WW1 British Army records were destroyed by fire during enemy bombing in 1940. Those that were saved are often damaged and incomplete; sometimes only a soldier's medal card or medal roll survived; these contain scant information, but do give his Regiment and Battalion, from which we have outlined his part in the Great War. In some cases we have been unable to find any relevant military records, and have then generally tried to offer the most likely explanation. Records of Royal Navy personnel have usually been found, as have those of Canadian and Australian forces, and the Commonwealth War Graves Commission. use the contact page to tell us what you know, in order to help us to maintain this site as a fitting memorial to each and every one. Please be aware that, while our project holds permission to display the images that you see, we do not own the copyright. ​These images may not be used by any other party without permission from the copyright owners : contact us for details. 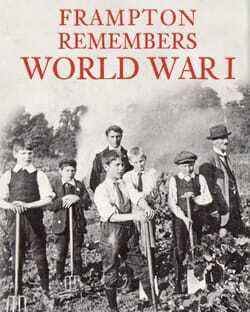 Frampton Remembers World War I tells the story of the village of Frampton-on-Severn during the First World War. Frampton is only one of many villages across Britain that were facing the same problems, and having to adapt to life during the War. Men who had been born and brought up in the village went off to fight…some of whom were not to return. Those who remained in the village were involved in war work, fundraising, and the everyday life in the village continued. Everyone was involved, including the schoolchildren, who would be given time off from lessons to work on the farms and pick fruits. Big changes came to Frampton, with the building of a milk processing factory, and also the arrival of German prisoners of war. before, during and after the war that were as ‘ordinary’ as thousands of other men across the country, but the photographs and the detailed information that is given brings these individuals to life. No one was spared from the effects of War, from the farm labourer to the Lord of the Manor. The book is a great read, even for those with no direct connection to Frampton, as you can imagine similar events in any village in the country. This site has been created to commemorate our servicemen. Find out more about the contribution of the people of Frampton to the war effort, both at home and in the Services. A photo speaks for a thousand words, so take a look at our gallery to see some of the fantastic images we have. Why not send us your own?